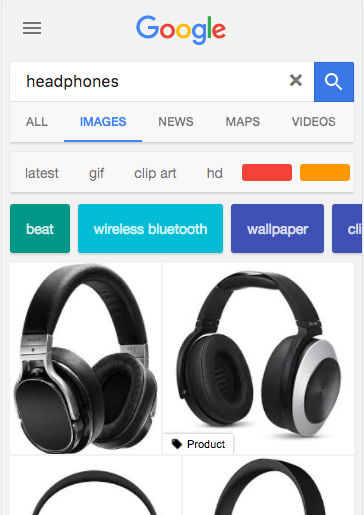 Google is constantly looking to improve relevancy in its search results and recently announced that they have added a new Google image badge to their mobile image search results. These badges will provide users with greater insight into the type of content linked to the image. This will hopefully help generate higher quality traffic for sites and help users find the information they seek faster. In the digital marketing industry, we have known for some time the power that images can have. When people consume content on their screens, they pay attention to the images on the page. Eye tracking studies have examined where people spend the most time looking. The studies found that, in some cases, consumers even spend more time looking at information-rich images than reading the text on the page. The Google Image Badge will help mobile users identify image sources On social media, images also dominate. Infographics receive three times as many likes and shares than other types of content. Facebook posts with images and Twitter posts with images also greatly outpace their counterparts without. When that information has been paired with relevant images, however, the retention of the audience will jump up to an average of 65%. When your images appear in the Google results, –you have the chance to draw traffic. Traffic from the image results tends to be relatively strong, with 63% of clicks made on images turning into site traffic. The problem that sometimes arises for these sites is the quality of this traffic. The new Google image badge may be the solution that addresses this problem. Google made an announcement on August 1 that it added badges to the images that appear in mobile image searches. These simple badges let the user know the type of content they will find on your website when they click through from the SERP. Currently, Google has badges for recipes, videos, products, and GIFs, but it has left open the question of whether they will develop more badges in the future. 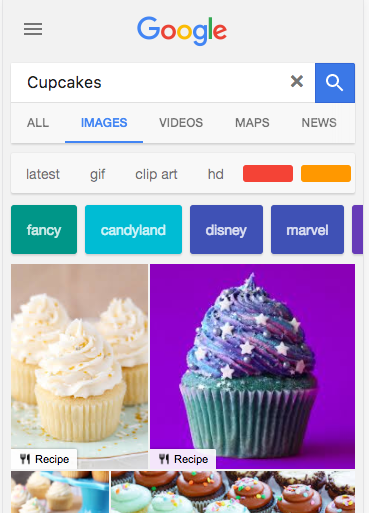 When you want to bake cupcakes, but you don’t know what kind, Image Search can help you make a decision. Finding an image with a recipe can be challenging: you might end up on a page that has only pictures of these delicious things, or a cupcake fan site that doesn’t have recipes, but everything else about them. To help users find exactly what they want, Image Search on mobile devices now includes relevant badges on the thumbnails. Currently, we have badges for recipes, videos, products, and animated images (GIFs). How can I benefit from Google image badge? Google said in its announcement that site owners who want to take advantage of this new feature will need to make sure their content has the appropriate schema markup. For example, if you have a recipe page, you will want to make sure your page has the recipe schema. This will provide Google with the information they need so the algorithm appropriately adds the ‘recipe’ badge to any images that appear on your site. After you have marked up your content, you will want to use the Google Structured Data Testing Tool to make sure that your content has the correct markings. If your image can bring you valuable traffic, you do not want your image to be the one in the search results without the badge. Customers will quickly realize that these badges let them know what they will see when they click. Sites that do not have a badge, therefore, will likely get overlooked when customers seek a particular type of information. To improve the chances of your images ranking well and being indexed for the correct searches you should also implement a stand alone image XML sitemap. Google continues to modify their algorithm and SERP to better serve the needs of their end users. As site owners, we need to understand these changes and see how they can be used to maximize the presence of the brand online. The more we align ourselves with Google’s concept of the ideal user experience while also taking advantage of these opportunities when they arise, the easier it will be to build a strong digital brand presence. SERP's will continue to become more and more competitive and small updates and tweaks can be mean the difference between major ranking improvements. To make the most of Google image search as an organic traffic generator you'll need to make sure a few bases are covered such as high res and low res versions of the image, keyword rich file names, using of alt text, an image sitemap and the use of schema on pages that display images. Have you been ignoring image SEO of late or is it part of your overall strategy? Let us know in the comments section below.